Merguez is a fresh sausage popular in North African cuisine. Usually made with lamb — or a mixture of lamb and beef — it’s spicy but not too hot, heady with earthy seasonings like cumin, garlic, fennel, paprika, and just a hint of cinnamon. 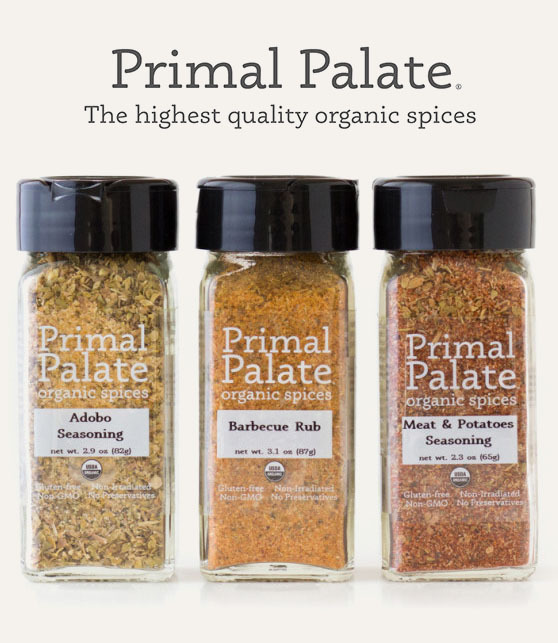 Although it contains many of the same spices as Ras el Hanout, the flavor is completely different because of the proportions of the spices. Spice alchemy! I’ve been tempted to try making my own merguez sausage for years; I even have a Kitchenaid with the right attachments! But I wanted the taste of merguez now, so I decided to skip the pesky “fill lamb casings” step and rely on friendly, two-bite sized meatballs instead. I recommend using a food processor to blend the ingredients for a tender, smooth texture, but if you’re in a hurry or don’t have a food processor, you can just mix the ingredients by hand. A few words about buying lamb: I’m a new and forever fan of Lava Lake Lamb; read my review here. I should tell you that I received a lovely package of complimentary lamb from Lava Lake, but from now on, I’ll be buying my own. It’s that good, and I have zero interest in eating the somewhat bland lamb of questionable origin available at the grocery store. Preheat the oven to 400F. Cover a large baking sheet with parchment paper or aluminum foil. In a small bowl, mix all the Merguez Spice Blend ingredients with a fork. Inhale the aroma and set aside. Those look sooooo good. I just made your Czech balls and am stuffing my face with them as I type 🙂 I have a paprika question for you. You don’t specify what kind of paprika you use. I figured for the Czech to use sweet Hungarian. In this recipe is it sweet or hot paprika? Great question! When I was researching various Merguez seasonings, some said hot and some said sweet. So it’s really up to you… I like to use a blend of both, or, honestly, whatever I happen to have in my cabinet. hi Mel! I’m going to try to make these meatballs with 1lb lamb and 1lb beef and serve on some sauteed cabbage. How much of the spice mixture should I use with that much meat? You mentioned that the recipe above would give several batches of meatballs and I don’t want to “overspice” the meat. Thanks! p.s. I LOVE your cookbook. My BF and I have made over 2/3 of the recipes and they are a big hit every time. Yum! Hey, Jennifer. The recipe calls for 2 pounds of meat and 4 tablespoons of Spice Mix — it’s listed in the meatball ingredients. You gave me a mini heart attack because I thought I forgot to include it! Glad you’re enjoying Well Fed! But seriously, those meatballs were a-MAZ-ing. Totally a keeper recipe. I just put it on a bed of cabbage sauteed with grapeseed oil, salt, pepper and garlic powder. I”m in the midst of a Whole30 and this was such comfort food. My belly thanks you. Grapeseed oil is not Whole30 or paleo. 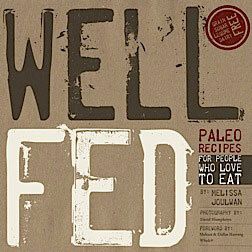 Melissa, you have put together the all time best paleo cookbook! 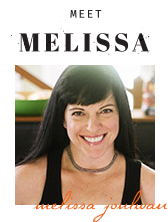 For those of you new to this site and Melissa I am referring to Well Fed; I heartily recommend it. I look forward to making the Merguez Meatballs this weekend. Thanks for posting. If you have another cookbook in the pipeline I will be one of your first readers. Cheers to you! Carol, thank you so much for your sweet words about Well Fed. I really appreciate it! Wow! 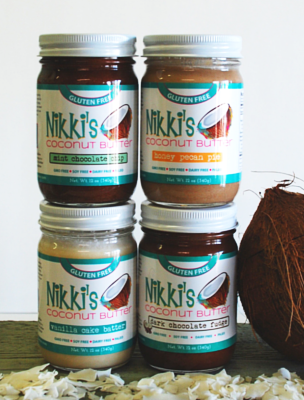 Big changes for you this year with nutrition. 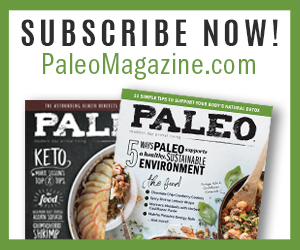 Congratulations on making the switch to paleo — are you feeling good effects from changing your diet? I’m definitely working on another book, and will keep posting new recipes in the interim. Glad you’re enjoying them. Keep us posted on how you’re doing! Can you recommend a recipe for the merguez spice blend? The Merguez Spice Blend recipe is listed above in the ingredients list, above the ingredients for the meatballs. Would I be able to use Ras el Hanout as a meatball seasoning, and if so, how much of that would you recommend per 2 lbs ground beef/lamb? Yes, you can! They won’t taste like Merguez sausage, but they will taste awesome. I’d recommend 1 tablespoon per pound of meat to start — but, honestly, for me, I’d probably use 2 tablespoons per pound ’cause I like things really spicy. Start with a moderate amount, then pinch off a little meat, fry it, and taste for seasonings, then adjust as necessary. These are yummy!! They will last me a few days too which is great because I started The Whole 30 this week and I needed some quick protein to scarf down! 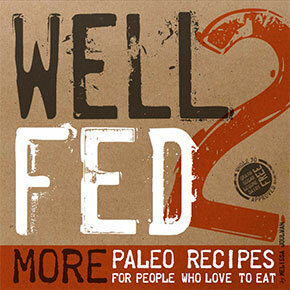 I would love it if I could get your Well Fed cookbook on Kindle (hint, hint)!! All your recipes look super yummy and super fun and your way of looking at things is Awesome!! I look forward to many more yummy dinners from your blog and eventually your book!!! Sweet! Glad you like them. 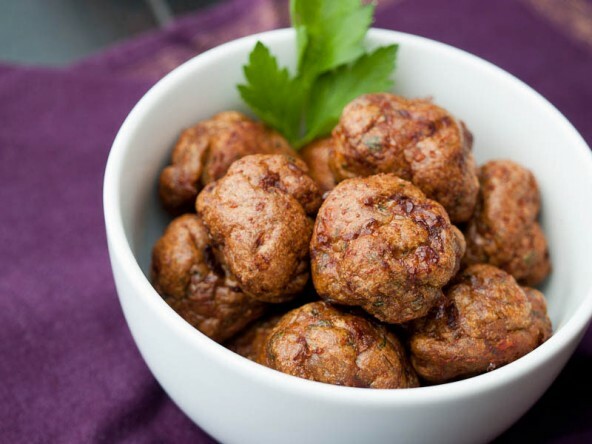 And I agree: having meatballs in the fridge to grab-and-go is awesome! We have a Kindle in process right now. Amazon offered to do a conversion for us for FREE because Well Fed was selling quite well. We reviewed the first version and are waiting for the next version to arrive… will let you know when it’s ready to be released! Glad you had fun breaking in the new spice grinder — enjoy the meatballs! I cut the recipe in half since I had only 1 lb. of ground lamb from das farmers market on hand. Oh. My. I also used whole fennel seed instead of ground since I didn’t want to make our coffee grinder taste like fennel for a year again. It was perfection. These are the best meatballs I’ve ever had, hands down. The spice mixture was just right. Thanks again, Mel! Amazing. Just made these for the second time, and the family is raving. Thanks. I prefer bison to both beef and lamb – do you think that would work okay? Hi, Cassie! You can pretty much always substitute ground bison for ground beef or lamb. Enjoy! This spice blend was awesome. Thank you for taking us around the world. Glad you liked it! I really hope I get to Morocco one day to eat Merguez Sausage from a street vendor. Is the 1 tablespoon of salt the correct amount? Because it breaks down to half your daily recommended salt intake in a 4 meatball serving (assuming each meatball is about an oz). Still delicious! Just very salty 🙂 but both my husband and dad loved them, so I can’t wait to try more recipes! Yes, for 2 lbs of meat, I recommend 1 tablespoon salt. You can always reduce the amount if it’s not to your taste. Absolutely A-Maze-Ing!!! I just made these for dinner with the moroccan dipping sauce, so so so good! 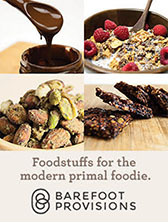 Thank you for all of your wonderful recipes, everything and anything I’ve made from your site or Well Fed have been delicious. Can’t wait to try something else. Hooray! Glad you like them! And thank you for the kind words about Well Fed! What is the merguez spice blend recipe?? I’m not sure I understand your question. There’s a list of ingredients above for the spice blend. After re-reading it, I understand. It didn’t say merguez spice blend at the top so I didn’t realize that was the “merguez spice blend”. Thank you so much! YUM!!! Made these last night to have in the fridge for breakfast, lunch, or snacks. One of my sons and I kept popping them in our mouths. He said I must make more this weekend. I just had a few with my morning eggs and coffee. So good and so much flavor. We don’t even need any dipping sauce. I’ve never cooked with elk, but I can’t imagine why it wouldn’t work in these. I bet it will be great! Just made these last night. doubled up with 2 pounds beef, 2 pounds lamb…came out amazeballs! Made the entire apartment smell great. Hooray! Glad you liked them and yes! the aroma is a serious benefit. I’ll skip on the dipping sauce, but the meatballs, sheer bliss. These are incredible! Spicy, juicy, with a crispy crust – GAH! No time to make dipping sauce – must eat balls (yes, I went there…)! Glad you like them — thanks for letting me know! I’m making these now but with venison instead of lamb. I must be reading it wrong, since no one else seems to be having trouble. It says, “This recipe makes enough Merguez Spice Blend for several batches of meatballs, so you can keep it on hand for meat-related emergencies.” but I only got about 6 Tablespoons of mix (and adding the amounts up, that looks right) and it calls for 4 Tablespoons of mix for one batch. So, not enough for even 2 batches. Did I put too much in? They’re in the oven now. I hope I didn’t ruin them. You’re all good. I was just being loose with my language — sorry! It’s definitely 4 tablespoons into the meatballs. Hope you like them! 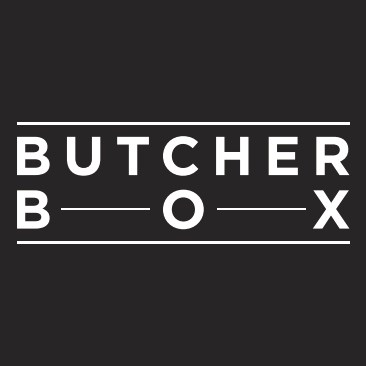 Long-time lurker here–would these work okay with all ground beef or even a mixture of beef and pork? I don’t have access to lamb (missed the farmer’s market this morning and my grocery options are woefully limited) and would like to whip up a batch for my lunches this coming week! Absolutely! Beef will work great! I think the pork is too mild, but yes to beef. Awesome! (And also an awesomely fast reply!) Super excited for these–and also for your cumin-roasted carrots + cauliflower couscous as sides. Three cheers for vegetables 🙂 Have a great day! These were good! I completely forgot to add in the garlic so sprinkled some granulated garlic into the mix when I was forming the meatballs (lazy!). Tasted great, I think I might whip up some tahini sauce next time. Ran out of lemons this time around. Thanks! Thanks for including the “Taste Great With” section. Big help to me! Oh, good! That part is fun for me. I’m glad it’s helpful!